Welcome to the penultimate installment of SQL Server A to Z (it’s not often I get to use “penultimate”). Officially, Y stands for Year, but that would be kinda boring, and quite short, so let’s run with it and talk about all sorts of date-parts-related stuff. Since this is, technically, a blog about the YEAR function, let’s begin with some functions that return parts of dates. The YEAR, MONTH, and DAY functions are pretty self-explanatory, returning the year, month, and day of the input date, respectively. An alternate method of retrieving this data would be to use the DATEPART function. Take a gander. And you aren’t limited to your basic year/month/day components for DATEPART, either. You can pull out time components, like hour/minute/second, all the way down to nanoseconds. There’s also functionality for getting the weekday (dw), the day of the year (dy), the week of the year (wk), even the quarter (qq). If I set DATEFIRST to 4, indicating a Thursday start, Monday is now the fifth day of the week. Not sure what your current DATEFIRST setting is? @@DATEFIRST will tell you. Please refer to my Amazon Wish List for ideas. When in doubt, bourbon is always the right size. Thanks. 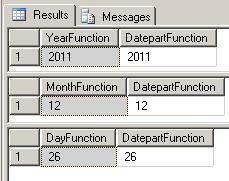 We can also add or subtract dateparts to date values using the DATEADD function. The last function we’re going to cover is DATENAME. We can use DATENAME to get the character string for the datepart of a particular date. This value is dependent on the value you’re using for SET LANGUAGE. In this case, the result is “Diciembre”. And now we see “Monday” and “December” for our result. For a full list of supported languages, look at sys.syslanguages. I hope you enjoyed this penultimate (had to get it in one more time) installment of SQL Server A to Z. Stop back later in the week to close out the year and the series.